Eye color is a hereditary trait that depends on the genes of both parents, as well as a little bit of mystery. The color of the eye is based on the pigments in the iris, which is a colored ring of muscle located at the center of the eye (around the pupil) that helps to control the amount of light that comes into your eye. Eye color falls on a spectrum of color that can range from dark brown, to gray, to green, to blue, with a whole lot of variation in between. The genetics of eye color are anything but straightforward. In fact children are often born with a different eye color than either of their parents. For some time the belief was that two blue-eyed parents could not have a brown-eyed child, however, while it’s not common, this combination can and does occur. Genetic research in regards to eye color is an ongoing pursuit and while they have identified certain genes that play a role, researchers still do not know exactly how many genes are involved and to what extent each gene affects the final eye color. Looking at it simply, the color of the eye is based on the amount of the pigment melanin located in the iris. Large amounts of melanin result in brown eyes, while blue eyes result from smaller amounts of the pigment. This is why babies that are born with blue eyes (who often have smaller amounts of melanin until they are about a year old) often experience a darkening of their eye color as they grow and develop more melanin in the iris. In adults across the globe, the most common eye color worldwide is brown, while lighter colors such as blue, green and hazel are found predominantly in the Caucasian population. Sometimes the color of a person’s eyes are not normal. Here are some interesting causes of this phenomenon. Heterochromia, for example, is a condition in which the two eyes are different colors, or part of one eye is a different color. This can be caused by genetic inconsistencies, issues that occur during the development of the eye, or acquired later in life due to an injury or disease. Ocular albinism is a condition in which the eye is a very light color due to low levels of pigmentation in the iris, which is the result of a genetic mutation. It is usually accompanied by serious vision problems. Oculocutaneous albinism is a similar mutation in the body’s ability to produce and store melanin that affects skin and hair color in addition to the eyes. Eye color can also be affected by certain medications. For example, a certain glaucoma eye drop is known to darken light irises to brown, as well as lengthen and darken eyelashes. It is known that light eyes are more sensitive to light, which is why it might be hard for someone with blue or green eyes to go out into the sun without sunglasses. Light eyes have also shown to be a risk factor for certain conditions including age-related macular degeneration (AMD). 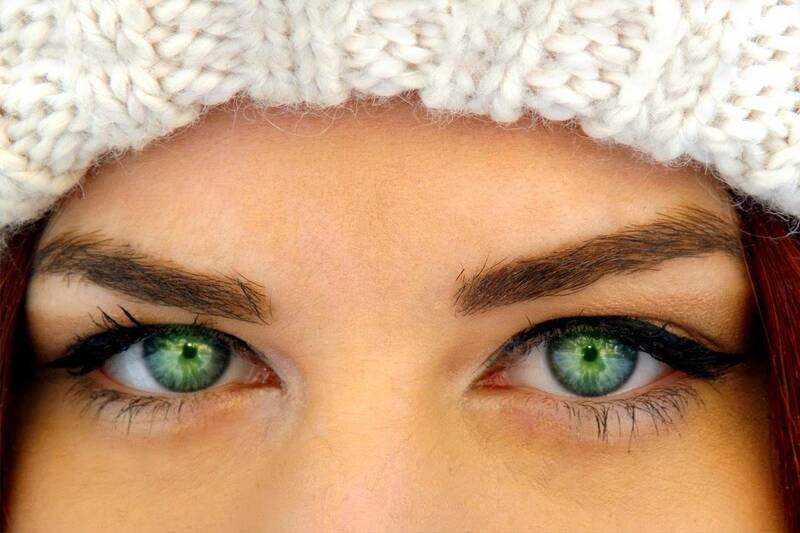 While we can’t pick our eye color, we can always play around with different looks using colored contact lenses. Just be sure that you get a proper prescription for any contact lenses, including cosmetic colored lenses, from an eye doctor! Wearing contact lenses that were obtained without a prescription could be dangerous to your eyes and your vision.